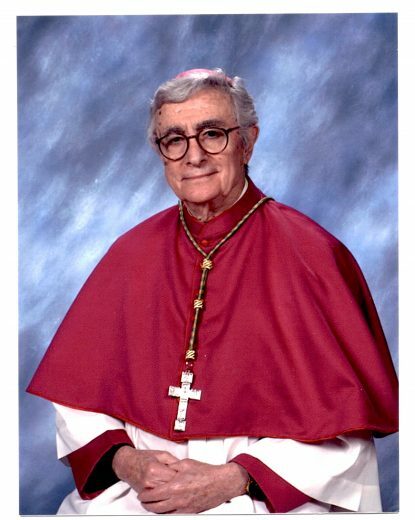 Auxiliary Bishop Louis A. DeSimone died Oct. 5 at age 96. Some 350 friends and admirers of retired Auxiliary Bishop Bishop Louis A. DeSimone gathered at the Philadelphia Country Club on the evening of Oct. 4 where he was to receive the 2018 St. Augustine Medal, given by the Augustinian Province of St. Thomas of Villanova. The guest of honor could not attend because he was in final preparation for a most important journey. Early on the following morning, Oct. 5, at the Monastery of St. Thomas of Villanova, Bishop DeSimone departed this life. It was the first Friday of the month, and in keeping with the promise of the Sacred Heart to St. Margaret Mary Alacoque, the good bishop — who had made many First Friday novenas in his 96 years of life — most assuredly went home to God. Louis Anthony DeSimone was born Feb. 21, 1922 in Philadelphia, the son of Italian immigrants Anthony and Nicolina DeSimone but raised in Bridgeport, where the family attended Our Lady of Mount Carmel Parish, an Italian personal parish. Louis would be the eldest of the three sons of Anthony, a barber and Nicolina, a housewife. It was a devoutly Catholic family, which may explain why all three sons would ultimately enter the priesthood. His parents attended Mass daily, and often his father would not only give a free haircut to someone down and out, they would leave with a coin. After Our Lady of Mount Carmel School, Louis went on to Bridgeport High School. He was considering entering the priesthood, but to enter the seminary at that point it might have been problematic. Cardinal Dennis Dougherty did not look kindly on public schooling and in an era when St. Charles Borromeo Seminary had more applicants than it could accommodate, the pastor of a small ethnic parish might not have the clout to get a recommended young man from his flock admitted. Meanwhile, according to Bishop DeSimone’s second cousin, Dr. Anthony Schiavone, he’d obtained a barber’s license and helped his dad at the barbershop. He was immensely proud of that, but did not intend it to be a life occupation. Not quite sure if he wanted to be a priest or a lawyer, on a scholarship he enrolled at Villanova College (now University). 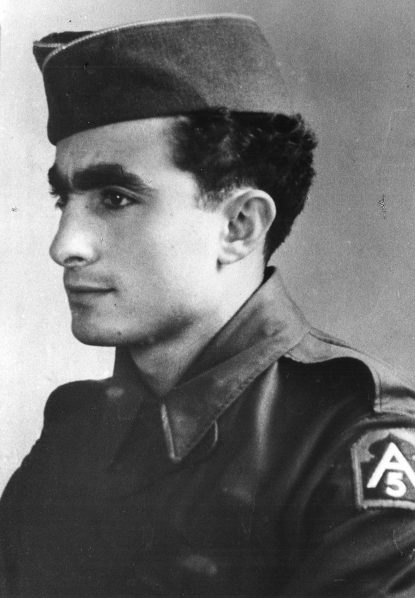 Sergeant Louis DeSimone, assigned as an Italian translator with the U.S. Fifth Army during the campaign in Italy in 1943-44, would later be ordained a priest and auxiliary bishop for the Archdiocese of Philadelphia. Louis was just 19 when in 1941 the U.S. entered World War II. Like all patriotic Americans of that generation he was willing to do his part. A military recruiter visited the campus and told interested students they could enlist in whatever branch they wished but could stay in college until they were needed. Louis signed up for the program but it wasn’t until 1943, when he was just one semester shy of graduation, that the recruiters came back. He happened to be fluent in Italian and the invasion of Italy was imminent. There was a need for Italian translators. After training he was shipped overseas to Casablanca where he was assigned to the Fifth Army, working as a translator at the headquarters often with the chief chaplain. After that it was on to Sicily, then up the Italian boot where there was hard fighting and bombing, including the historic monastery at Monte Cassino, which was destroyed. By this time the Fascist government in Italy had fallen, but German occupiers were still putting up stiff resistance especially at Anzio, not far from Rome. Although he was not an infantry soldier, Sergeant DeSimone saw first hand the terrible destruction and loss of life that is war. Rome itself was declared an open city and the American Army entered without incident. Also during that period in Rome as a translator he worked closely with Msgr. (later Cardinal) Francis Brennan, a Philadelphian and Vatican official who stayed in Rome during the war. Msgr. Brennan gave him a letter of recommendation for his seminary application but the priest suspected Louis’ mention of Pope Pius saying, “I’ll pray for you,” sealed the deal. Shortly after his discharge he confided his wish enter the seminary to Father John O’Connor, an young assistant pastor at Our Lady of Mount Carmel, who not only encouraged him but gave him his own four-volume set of the Summa Theologica of St. Thomas Aquinas, which would be useful when Louis entered St. Charles Borromeo Seminary. Meanwhile his brother Russ entered the Augustinians and later Sal was accepted by the Diocese of Camden, where he was ordained and ultimately rose to the rank of monsignor. At St. Charles Seminary, because of his prior college and military service, Louis DeSimone was the oldest man in his class. And in fact that was an affectionate nickname, “the old man.” In spite of his age he outlived most of his classmates and now there are only three left, and all have nothing but respect for him. “I sat next to him in class,” said Father William J.J. O’Donnell. He had a delightful sense of humor back then and it carried through when he was a bishop. He was also the head prefect for our class and he really helped us. Louis DeSimone passed his seminary studies with flying colors and on May 10, 1952, he and 29 of his classmates were ordained as priests by Archbishop (later Cardinal) John F. O’Hara at the Cathedral of SS. Peter and Paul. The happiest day for a priest, Bishop DeSimone would later say in an interview, is the day he is ordained as a priest. After an initial assignment as a teacher at St. Thomas More High School with residence at Annunciation Parish in South Philadelphia, he served at a series of parishes that were either Italian personal parishes or parishes with a sizable Italian population, but he was equally esteemed by his people regardless of nationality. His first parochial assignment was at St. Donato in West Philadelphia where, he would recall, Father Michael Pasco gave him the example of what a parish priest should be. After St. Donato he was parochial vicar and then in 1968 pastor of St. Cosmas and Damian Parish, Conshohocken. Among secondary assignments he was appointed to the Executive Committee of the Catholic Charities Appeal and in 1971 Archdiocesan Director of Catholic Relief Services. 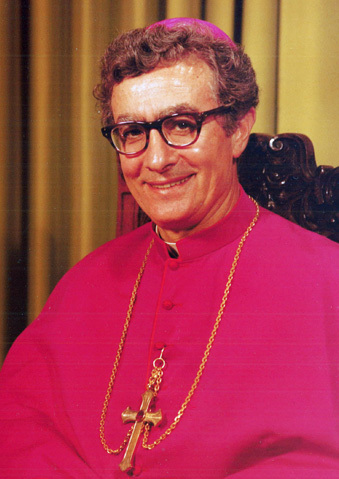 In 1975 he was appointed Chairman of the Heritage Group Committee for the 41st International Eucharistic Congress held in Philadelphia in 1976, the same year he was named an honorary prelate to his Holiness with the title monsignor. That same year he was appointed pastor of St. Monica Parish in South Philadelphia, a position he would hold for 25 years until his 2001 retirement. Also in 1976 after a disastrous earthquake occurred near Friuli, Northern Italy, he was sent by Cardinal Krol to that region to coordinate earthquake relief. He returned, at Cardinal Krol’s request in 1980, to assist coordination of earthquake relief in Southern Italy. The announcement of his appointment as an auxiliary bishop by Pope John Paul II was made June 30, 1981. This was a point of special importance in the Italian American community because he was the first Philadelphia bishop ever to share their heritage. As with all bishops he was also given a titular see. It was Cillium, a no longer active diocese in North Africa. Very clearly a miter would never go to his head. At the same time as his appointment it was announced that Msgr. Francis Schulte, a former archdiocesan superintendent of schools and then pastor of St. Margaret Parish, Narberth, was also named auxiliary bishop. The two had stood side by side at the Cathedral of SS. Peter and Paul for their priestly ordination in 1952 at the hands of Cardinal John O’Hara and now on Aug. 12, 1981 they again stood side by side in the basilica to receive their episcopal ordinations from the hands of Cardinal John Krol, assisted by Bishop John Graham and Bishop Martin Lohmuller. Shortly afterward Bishop Schulte left to become Bishop of Wheeling-Charleston, West Virginia and later Archbishop of New Orleans. He returned to the Philadelphia area after his 2002 retirement until his 2016 death. During most of his years as an auxiliary bishop of Philadelphia, Bishop DeSimone had a relatively low profile. That was partly because Cardinal John Krol’s successor, Cardinal Anthony Bevilacqua, relied mostly on his administrative staff of monsignors as vicars for conducting the affairs of the archdiocese rather than his auxiliary bishops, whose duties were mostly ecclesial, especially confirmations. 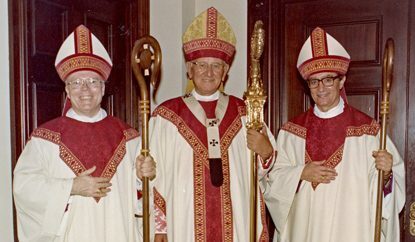 Bishop Louis A. DeSimone at his episcopal ordination in August 1981. That perfectly suited Bishop DeSimone, who had a reputation for his kindly manner of conducting confirmations, putting the children at ease. He also immersed himself in St. Monica Parish where he would remain as pastor until 2001, four years after his retirement as auxiliary bishop in 1997 at the mandatory age of 75. Earlier this year the corner in front of St. Monica Church on Ritner Street was officially renamed Bishop Louis DeSimone Way, but the real memorial is in the hearts of the people. The person who remembers Bishop Simone the most at St. Monica is Father Joseph Kelly, his successor as pastor. “I’ve known him for about 30 years,” Father Kelly said. “He ordained me as a transitional deacon. He meant the world to me. I don’t know what I will do without him. He was absolute humility. He would call me ‘Joe my son,’ and I would tell him who was sick in the parish and he would say, ‘Tell them I will pray for them,’ and it would be so consoling to them. During most of his retirement years Bishop DeSimone resided first at St. Justin Martyr Rectory, Narberth, and then at St. John Baptist Vianney Rectory, Gladwyne. His brother, Msgr. Salvatore DeSimone, died in 1989. After his retirement Father Russell DeSimone lived for a time with the bishop, but when his health began to fail he moved to the infirmary at St. Thomas of Villanova Monastery. Bishop DeSimone would visit him daily, help him with his meals and celebrate Mass with him. After his death in 2014, Bishop DeSimone kept up his relationship with the monastery, visiting often and when his own health declined that was where he opted to spend his final days. It was Father Michael DiGregorio, Prior Provincial for the Augustinians based in Villanova, who recommended Bishop DeSimone for the St. Augustine Medal, which was officially bestowed the night before his death. The medal is an honor given to an individual or individuals who exemplify the teaching of St. Augustine, a deep commitment to the Order of St. Augustine and the Augustinian values of truth, unity and charity. Bishop DeSimone certainly filled those requirements tracing all the way back to his student days at Villanova University. You don’t have to be an Augustinian to see that. 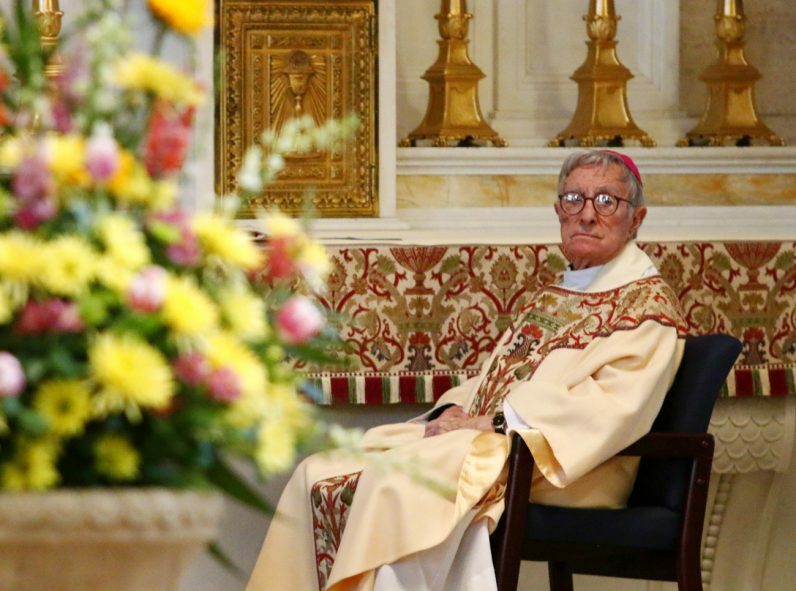 Philadelphia has lost a very good bishop, but it’s heaven’s gain. Enjoyed the beautiful tribute on Bishop DeSimone. I had an opportunity to correspond with him the past few years, he was my father’s cousin. He certainly had a very full and beautiful life!